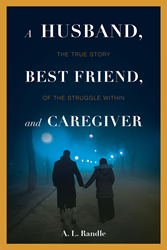 Recent release “A Husband, Best Friend, and Caregiver: The Struggle Within” from Page Publishing author A. L. Randle is a heartwarming account that tackles on life’s overwhelming circumstances that test one’s strength in character. A. L. Randle, a retired football player in the Arena Football League and a loving husband, father and pet owner, has completed his new book “A Husband, Best Friend, and Caregiver: The Struggle Within”: a gripping memoir filled with joyful, heartrending, and courageous moments amid the toils of disease. Published by New York City-based Page Publishing, A. L. Randle’s tale follows the author’s inner battle with fear and anxiety as he deals with his wife’s challenging journey which, ultimately, leads to a profound healing, acceptance, and gratitude. Readers who wish to experience this poignant work can purchase “A Husband, Best Friend, and Caregiver: The Struggle Within” at bookstores everywhere, or online at the Apple iTunes store, Amazon, Google Play, or Barnes and Noble.